Combine the butter and cream cheese. Cream until smooth. Add in flour, and mix well. Form the dough into 30 – 1 inch balls. Put the balls in lightly greased muffin tins. Press dough in cups to form a shell. With a fork, pierce bottoms, sides of shells. Bake shells at 400 degrees F for 5 minutes. Let cool. 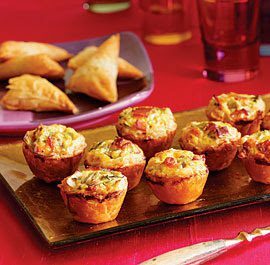 Combine all the quiche ingredients: egg, milk, salt, pepper, cheese, bacon, onion and green pepper (if using). Stir mixture well. Pour or spoon into the ready made shells. Bake at 350 degrees F for 20 minutes.